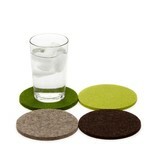 Graf Lantz traditional Bierfilzl are the highest quality German merino wool felt coasters on the market today. Their clean and minimal execution offers an unexpected textural and refined modern heritage element to any home decor. This set includes 4 hand-cut heavy duty 5mm thick wool felt coasters to provide extra surface protection from the naturally water resistant material.